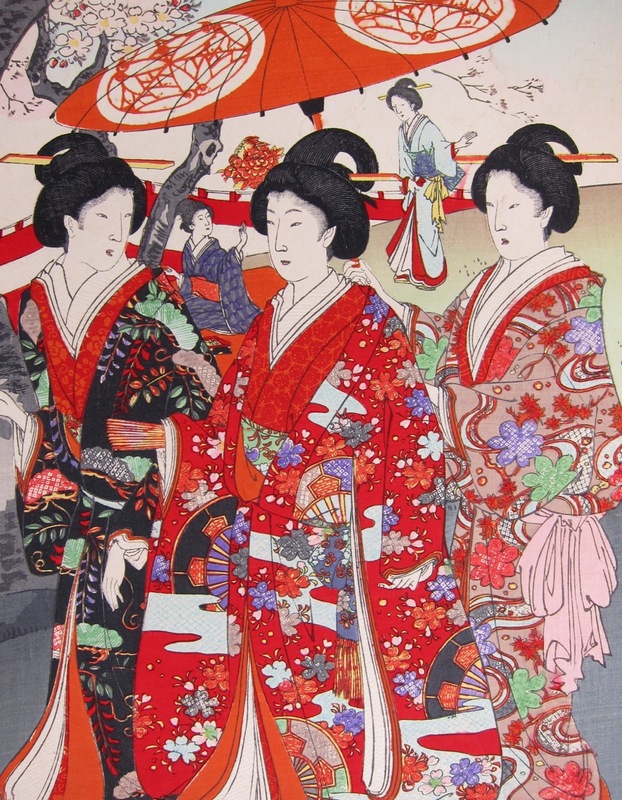 Toyohara Chikanobu (1838 - 1912) Cherry Blossoms Party at the Chiyoda Palace (Chiyoda Ooku Ohanami), 1894. Oban triptych. The Palace itself is the Chiyoda Palace or Edo Castle as it was known. It was built in 1457 by the warrior Edo Shigetsugu in what is now the Honmaru and Ninomaru part of the Castle. It later became the seat of the old Tokugawa shogunate who rebuilt it in 1593 and completed it in 1636, but after centuries of power and total domestic and military dominance, the old regime, weakened and no longer relevant, were required to vacate the old Edo Castle in the revolution of 1868. Like so much of Japan’s past, the bulk of the medieval castle was pulled down. Chikanobu shows a scene of cherry blossom viewing; elegant ladies and children playing blind man’s buff move among the tranquil scene of blossom and flowering trees. In the foreground the top of a screen is just visible, screening the women from prying eyes… all of those except us, the viewers that is.